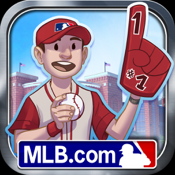 REQUIREMENTS NOTICE: MLB Ballpark Empire is only compatible with the following devices: iPad 2, 3, 4 and Mini; iPhone 4, 4S, and 5; and iPod Touch 5th Gen. Please make sure your device is supported before downloading. The game that puts you in the executive suite managing your own MLB team and stadium is now available on the go. Select your favorite MLB team and build your roster with hundreds of real MLB players. Build your team's stadium just like in real life or mix your favorite elements together. You'll find iconic ballpark favorites like the Green Monster, Monument Park, the Think Blue Dodgers sign, the Cubs W flag, and much more! - Play as any of the 30 MLB teams. - Hundreds of MLB superstars to add to your roster. - Play through a real MLB season -- can you win the pennant? - Manage your own concessions - earn revenue selling Hot Dogs, Popcorn, Pizza, and more! - Hire your front office staff to keep your Empire running smoothly. - Visit your Facebook friends' ballparks and play friendly matches. Your Facebook account is fully synced across all devices, so your progress will be accessible anywhere! MLBPA-Official Licensee, Major League Baseball Players Association. Visit www.MLBPlayers.com , the Players Choice on the web.